Letter to Martha Berry from William McKee informing Miss Berry that he can not come to the trustees' meeting nor could he bring Mrs. McKee with him even though she would get great pleasure out of the visit. He also informs Miss Berry that he feels that he is a useless trustee even though he still has great interest in the schools. He also wonders whether Mr. Ford's recent visit to the schools has increased the endowment. Mr. McKee informed Miss Berry that while he was in Cuba and saw Mr. Ford's visit to the schools in the paper. Wm. 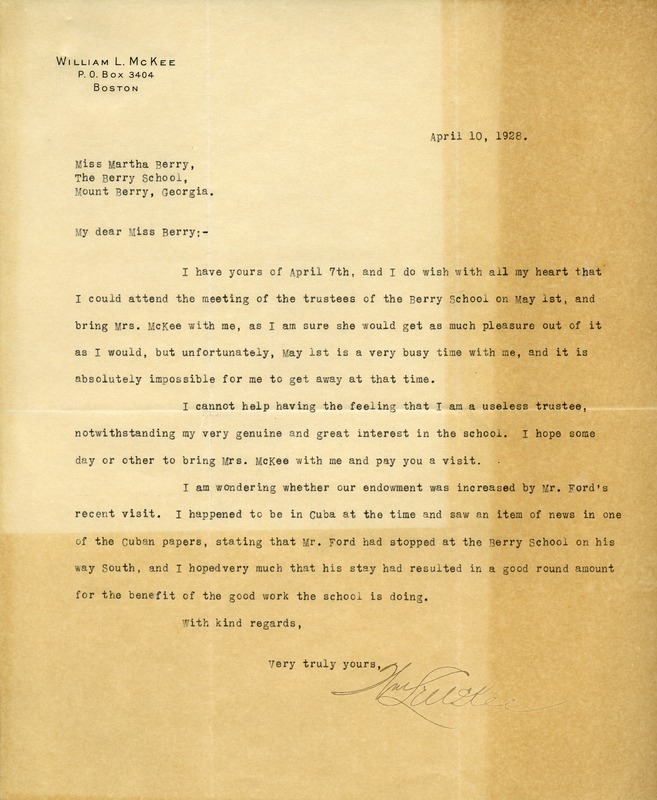 McKee, “Letter to Martha Berry from William L. McKee.” Martha Berry Digital Archive. Eds. Schlitz, Stephanie A., Chelsea Risley, Haley Fortune , et al. Mount Berry: Berry College, 2012. accessed April 24, 2019, https://mbda.berry.edu/items/show/8319.